St. John’s College is the third oldest college in the United States (reportedly behind Harvard, established in 1636, and College of William and Mary in 1693). Here is a timeline of St. John’s history and some fun facts. Learn more about our traditions. The King William’s School, the Maryland colony’s “free” school, is founded. The state of Maryland charters St. John’s College, merging it with King William’s School; four of the college founders signed the Declaration of Independence in 1776. The former governor’s mansion, McDowell Hall, is completed and serves as the foundation for the college; it is now the third oldest academic building in continuous use in the country. Francis Scott Key, a St. John’s alumnus, watches the British bombardment of Fort McHenry in Baltimore and pens a poem—“The Star-Spangled Banner”—commemorating the American victory. 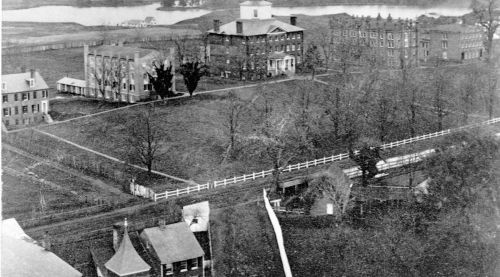 During the Civil War when Camp Parole is built outside the city of Annapolis, the Union’s medical corps takes over St. John’s buildings, which became known as College Green Hospital. The Black and Orange, the St. John’s College football team, earns a 62-0 victory against what is now the University of Maryland, making the front page of the Washington Post. A fire engulfs McDowell Hall and nearly burns the historic center of St. John’s College to the ground; in the aftermath of the blaze, alumni successfully advocate to have the building restored as close as possible to the original design. Stringfellow Barr and Scott Buchanan implement their big idea, the New Program, which the college still follows today. Alumni Jac Holzman and Paul Rickolt started Elektra Records in Holzman’s dorm room. The label roster includes such legendary bands as Queen, the Doors, the Stooges, MC5, and many more. St. John’s admits its first class of women students; American folk legend Woody Guthrie performs at the college. President Dwight Eisenhower dedicates the McKeldin Planetarium and two other buildings on the Annapolis campus. The college’s Santa Fe campus opens, with 81 students in the first freshman class. St. John’s launches a summer institute for teachers, which will become the St. John’s College Graduate Institute. The Johnnies battle the Midshipmen of the U.S. Naval Academy in the Annapolis Cup croquet match, which has become a beloved tradition. Christopher B. Nelson (SF70) is inaugurated as 23rd president of the Annapolis campus. The Eastern Classics program officially joins the Graduate Institute in Santa Fe. Six million television viewers tune in to a segment about St. John’s on the Today Show. Mark Roosevelt is inaugurated as seventh president of the Santa Fe campus. Panayiotis (Peter) Kanelos is named the 24th president of the Annapolis campus after Christopher B. Nelson retired at the end of the 2016-17 academic year. On September 12, St. John’s announced a new philanthropy-centered financial model and tuition for undergraduate students was reduced from over $52,000 to $35,000 beginning with the 2019-20 academic year. St. John’s launched a $300-million capital campaign, Freeing Minds, and was described as “The Most Contrarian College in America” by the New York Times columnist Frank Bruni. The St. John's College Digital Archives provides online access to special collections at the Greenfield Library (Annapolis) and Meem Library (Santa Fe).